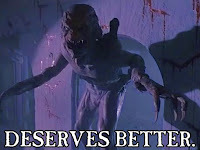 A group of '90s standard twenty-something high schoolers up and slam their car into, beat over the head, and damn near burn the old witch keeper of Pumpkinhead to death. The titular demon then revives after these dumbasses perform an impromptu ritual using his human-form corpse. The windy, schizophrenic strobe lighted kills begin anew as the Elephantiasis sufferer from Hades stalks the countryside by night. There's two predominant types of "good" cheap horror programmers. The ones in which filmmakers pleasingly thrive under such piecemeal conditions while the other kind that may not have this quality, but get by on sheer gusto and/or laughs spurred by their ineptitude. Jeff Burr's Pumpkinhead II: Blood Wings doesn't sit in either camp instead landing with match grade accuracy into a cold middle ground. The result just might be the most uninteresting second sequel of a mainstream horror franchise ever. The cheapness of the whole thing quickly becomes painfully tacky and too obvious to ignore. Everyone comes out looking bad, especially Director Burr, with one getting the impression the studio either pissed him off or he having absolutely no interest in the material. The barren sets are cramped with no directorial flare to enliven them, the "action" sequences sloppily cobbled together, and I swear the same two chairs against a wall of a one room police station also appear against the wall of a hospital lab. You know there's serious problems when the most interesting shot is a camera taped to a shovel handle. Even little details seem thrown away, like a brief shot of a car backing up after the old witch gets slammed into by the teens. There's a million ways to frame a car inquisitively backing up. Here it's a boring roadside shot with the rear end barely drifting into the left side and stopping as the next shot begins. That might seem meaningless, but it's in a long line of who-gives-a-damn piss takes. This sequel only shows how solid the work of Stan Winston, Lance Henriksen, and the host of writers of the original really is. Burr and the two no-other-credit writers took a creation born from Hell's Autumn season and unemotionally plunged into '90s clunker purgatory. I lasted about fifty minutes in and feel I'm not missing a single thing by halting the tape from utter disinterest. I haven't seen Ashes to Ashes or Blood Feud, but after this the only direction to go is up. Come on, Jayson! This isn't that bad... it is WAY better than what came after it, anyway.